Today is National Signing Day! 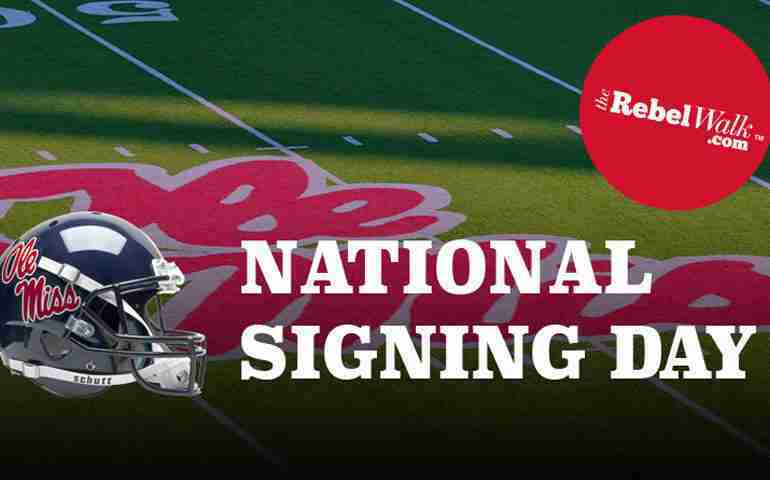 We’ll keep you updated as the newest Ole Miss Rebels sign their letters of intent. 4-star wide receiver Jonathan Mingo signed with the Rebels Wednesday morning at Brandon High School. Mingo, who committed to Ole Miss back on July 31, 2018, chose the Rebels over Mississippi State, Georgia, and Florida. The 6-foot-2, 200-lb Mingo, An Under-Armour All-American, is the fifth wide receiver signee for the Rebels Class of 2019. According to the 247 Sports Composite Rankings, Mingo is the No. 12 prospect in the state of Mississippi and the No. 32 wide receiver in the nation. Mingo also held scholarship offers from Notre Dame, Auburn, Arkansas and Oregon, to name a few, and was hotly pursued by Georgia up until his signing with the Rebels Wednesday. Mingo caught 77 passes for 1,451 yards as a senior at Brandon High School and also caught 14 touchdown passes. Mingo will join other Ole Miss wide receiver commits Jadon Jackson, Dannis Jackson, Dontario Drummond, and Jordan Jernigan who turned in their letters during the December signing period. All the experts who thought DT LeDarrius Cox would flip from Tennessee to Auburn only got it partly right. The first-team Class 7A All-State (Alabama) defensive lineman flipped from Tennessee to Ole Miss on Wednesday morning. Cox, a first team Class 7A All-State selection, finished 2018 with 42 solo tackles and 14 assists for the McGill-Toolen Yellow Jackets. Cox, who played in the Mississippi-Alabama All-Star Classic, also notched eight tackles for loss and five sacks. Four-star quarterback John Rhys Plumlee, a two-sport star in baseball and football, signed with Ole Miss after committed to the Rebels Monday. Although Plumlee had been committed to Georgia, he selected Ole Miss over the Bulldogs, as well as Mississippi State, Auburn, and Florida State. The 6-1, 185-pound Plumlee is out of Oak Grove (Miss.) High School and is rated as the nation’s No. 13 dual-threat passer by the 247Sports Composite index. He is the No. 15 player in the state of Mississippi’s 2019 class. The wait is over! The nation’s No. 3 running back and No. 2-ranked player in the state of Mississippi has signed his national letter of intent with Ole Miss. The five-star prospect out of Jackson Prep (Miss.) took official visits to Ole Miss State, Clemson, and Alabama over the last month or so.